John Gillespie Magee, Jr., the WWII poet and fighterpilot who wrote “High Flight,” the anthem of aviators for seventy-five years, left the world with an even greater legacy—more than a hundred letters detailing the angst of a teenager in a war-torn world. Sprinkled throughout the letters are his sentiments for a young lady named Elinor Lyon. 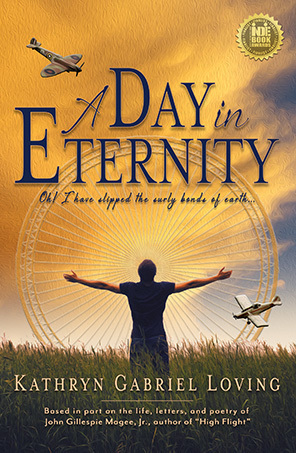 The relationship between John and Elinor is featured in my novel, A Day in Eternity. Elinor Lyon was the prim daughter of the headmaster at Rugby School in England where John attended from 1935-39. Because John’s own father was a missionary in China, the Lyon family took him on frequent holidays, during which time John and Elinor were free to frolic the hills and lakeshores of England. Given their literary interests we can guess the conversations touched on literature and poetry. John was expected to become a great literary mind, particularly for his poetry. He learned to compose verses because Elinor herself wrote it. Now, John was rebellious as a teenager by Rugby standards. He preferred to climb clock towers or read Goethe rather than concentrate on Demosthenes. “Plenty of time, we say, for Beauty afterward,” he wrote. “Suppose there is no afterward?” He despised the routine of school and pursued his own studies. Even so, he won the coveted Poetry Prize at Rugby for a poem entitled “Brave New World,” a philosophical look at life from the perspective of death. Who knows what might have blossomed between John and Elinor in time had war not interrupted them? John sailed the Queen Mary to America in August of 1939, mere weeks before England entered war with Germany. Elinor had already been ensconced in a Swiss school for months by then. John, being an American citizen through his father, was barred by the State Department from returning to England, and when travel reopened to US citizens, his passport was inexplicably canceled. He begrudgingly completed his secondary education at a prep school in Connecticut and won a scholarship to Yale to begin in the fall of 1940. Once he was marooned in America, though, he began to miss the “rushing intellectual streams” of England despite his previous criticism that the school demanded scholastic conformity. Desperate to return, he launched a letter campaign upon his parents that included the rationale of Plato, among many other works. Was it boredom that made him so anxious, or was it that he missed Elinor? He had dedicated a book of poetry to someone bearing her initials, EBL, which he handcrafted on a real press at the Connecticut prep school. Not that John didn’t pursue other love interests. While sailing on the Queen Mary to America in 1939, he spent sunsets and sunrises with many a member of the girl’s music band on board. He enjoyed the company of a handful of girls who traveled in the circle of his wealthy aunt in Pennsylvania and later while he completed his high school studies in Connecticut. He even became engaged, supposedly, but it was Elinor who held his heart. Rather than take advantage of his Yale scholarship upon graduation, he joined the Royal Canadian Air Force during the Luftwaffe air attack on Britain in September of 1940. Learning to become a fighterpilot seemed to be his only chance to return to England, and in doing so he discovered a talent for flying and a thrill for danger. What Roosevelt had called the “aerodrome of democracy,” the Canadian skies became an arena for his winged escapades. We have to guess that his secret Beatrice was none other than Elinor Lyon. Elinor was a shy poet; few of her verses ever reached the light of day and then only in the wake of John’s biographies decades later. She had composed in simple rhymes and copied them into journals beginning in 1934 and ending in 1944. In her early years she wrote about knights and child spies and nature. Poetry for her teenage years became a cathartic release over love lost and the tragedies of war. Unfortunately, correspondence between Elinor and John was not archived, but there is evidence that they wrote each other. For instance, he thanked his mother in a letter for sending one of Elinor’s letters to him, one that he’d searched for everywhere. What I’d give to read this letter given he’d felt so desperate to find it. Did they exchange drafts of their poetry? Their themes often dovetailed and expressed the same sense of yearning and introspection. The sky was calmed of dread. You turned and saw me there. Your lovely self before my eyes; it seems. To love is pain! But did you really care? —To long to touch your hands, your lips again? After two years in North America, John finally reunited with Elinor in England in the summer of 1941. He was a commissioned Pilot Officer by then and learning to master the Spitfire. First chance he got, he grabbed an old plane at the air base in Wales and flew himself to meet the Lyon family on a fruit-picking holiday in the Cotswalds. He returned the following day, and for several days thereafter he buzzed their lodging with his Spitfire. When weather turned bad, he took a train and stayed overnight. He also rendezvoused with Elinor in Oxford where she attended college, she feeling bad that she was reading Milton while her friends were at war. He wrote about these encounters in his letters home, testifying that this remarkable woman was the one for him, despite the fact that he still enjoyed chance meetings with other women in the pubs. Elinor’s journal contained many entries like the above-mentioned “Imagined Scene,” but there is no indication that any of the poems were composed with John in mind prior to the fall of 1941. She did mention the initials of others in her footnotes. Reading between the lines, it is apparent that she’d had a few attractions and disappointments where her own heart is concerned. Through agonies to a crown. So can we say that John was the young flier converted by journalists into a sort of worshiping Dante, starry-eyed over his Beatrice? Can we say that Elinor was his Beatrice? Yes, and here’s why. On August 18th John began composing his sonnet, “High Flight.” “It started at 30,000 feet and was finished soon after I landed,” he wrote in a letter to his parents. In a previous letter written on August 17th, he mentioned that it was Elinor’s birthday and that he would call her if he could think of something to say. 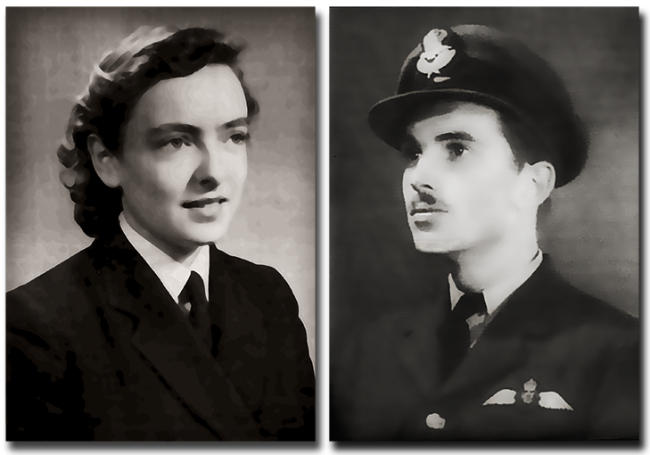 It is my contention, or at least my imagining, that he did call her on her birthday, and then elated from the call, he experienced an epiphany while flying the Spitfire the next day. In light that knows no cloud. For her part, Elinor later confessed to John’s biographer an affection for him and said she enjoyed his humor and intellect. Even so, she thought him immature, she being a full ten months older than he. John had to know of Elinor’s lack of enthusiasm for a romance, but that didn’t stop him from thinking that he made headway with her every time they met after their reunion in England. Elinor married a different RAF pilot, one who was a substitute English teacher at Rugby School. While raising her children, she wrote children’s novels. One of her series was about Ian and Sovra, young adventurers who got themselves in and out of scrapes. When they were together, Elinor had called John by the Scottish version of his name, Ian. I wonder … . The letters of John Gillespie Magee, Jr., are archived in the John G. Magee Family Papers, Record Group No. 242, Special Collections, Yale Divinity School Library. Elinor Lyon’s unpublished poetry and notes (used with permission by her son, Roger Wright) are archived at the Seven Stories, National Centre for Children’s Books in New Castle, U.K.
A Day in Eternity explores Elinor and John’s relationship. Currently available in all formats on Amazon, Barnes & Noble, Apple, and most places where ebooks are sold. A Day in Eternity , John Gillespie Magee Jr. Author of "High Flight"